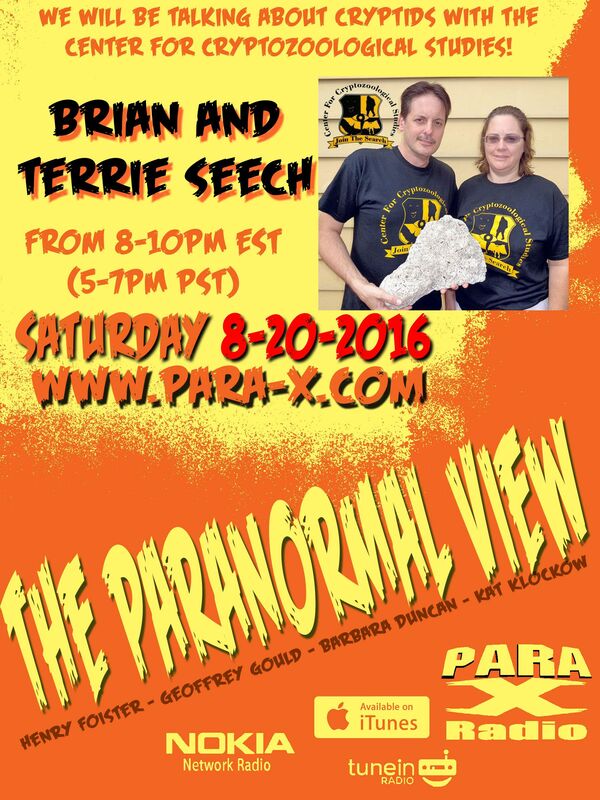 20 August 2016 "The Paranormal View"
Henry asked about what got them into the paranormal. Terrie spoke about her young adult life UFO sightings, as well as ghost experiences in her childhood home. They went into more details about various UFOs as Henry worked at getting me back on the call, as Skype kept kicking me off the call throughout the show tonight. She and Brian saw a UFO once when they were out trick or treating. A child of the 70s, Brian had watched the In Search Of type shows, specifically Peter Graves' hosting Mysteries Monsters Mysteries Monsters "documentary" series. Kat pointed out how back then shows like Unsolved Mysteries dealt with various subjects, while nowadays various paranormal series are topic specific. Terrie gave shout outs to their Center for Cryptozoological Studies group's core members, thanking them for their investigative work. In southwest of Pennsylvia, they and their group goes out both at night and during the day, the latter being understandably easier so as to spot tracks. Kat had them discuss cryptids that have actually been sighted at Gettysburg. Brian stressed they and their group have collected and archive thirty year's worth of journalism articles on sightings. We talked about Sasquatch and their level/s of intelligence, seemingly their knowing to avoiding leaving tracks and such. Henry asked after the September 17th Mothman Festival, lamenting his probably not being able to attend. Terrie spoke about some of her ghost experiences in the home in which she grew up. Skype was being a complete dink to me this whole evening, consistently dropping me, then having a "speaker issue," when I could no longer hear anyone, though they could hear my typing. I rebooted, and as I accepted the call, Skype cancelled it to update itself (an annoyance usually taking place before the show), then I was able to get back on. Meanwhile, no one but Henry and the live chat room could actually hear the commercial breaks' audio. Ceiling Cat Barbara Duncan reported out havng listeners tonight in the US, the UK, Canada, Unknown, and Singapore. A fellow sci-fi fan, Brian Seech and I also turned out to be fellow fans of the film They Live. Kat and I revelled in learning Brian being a fellow Kaiju movie fan, specifically Godzilla although while he never officially got into the TV series version of Doctor Who he did see the two Peter Cushing cinematic Doctor Who and the Daleks/Dalek Invasion Earth 2150 AD feature films. Brian stressed that ghost data still being trickier as proof rather than physical evidence cryptids leave, such as tracks. Kat spoke about her latest fascination: Dog Man, and that Brian and Terrie work with the new North American Dog Man Project. Brian indicated there being a cyptid called the Chicora Gargoyle that, like the Dog Man, is often seen near power substations. We also discussed the numerous "albino" (white furred) Sasquatch sightings. A lot of the best corroborative witness sightings were pre-Internet, so witnesses were never exposed to contamination by seeing things online. We did bring up my own home state's cryptid, the Jersey Devil cryptid, and my knowing my Jersey Devil Hunter and videographer friend Brian Jude who works with the Jersey Devil Hunters group. CC asked about whether Sasquatch are terrestial animals, or inter-dimensional beings. The issue of their being territorial was also addresed. October 15th-16th they're hosting 2nd Annual Bigfoot Day in Beaver Creek State Park, Ohio, which will also have an Overnight, after a The Beast of Whitehall screening of the documentary short.